The final day of our northern Vietnam road trip is a bit less off the tourist trail because we are now in Sapa. This northern hill town has become the trekking capital of Vietnam, making Sapa much more touristy than anywhere else we have been this week. As such, the otherwise rather charming town has all of the traffic, shopping opportunities, tourist restaurants, and touts of other well-touristed Asian cities. 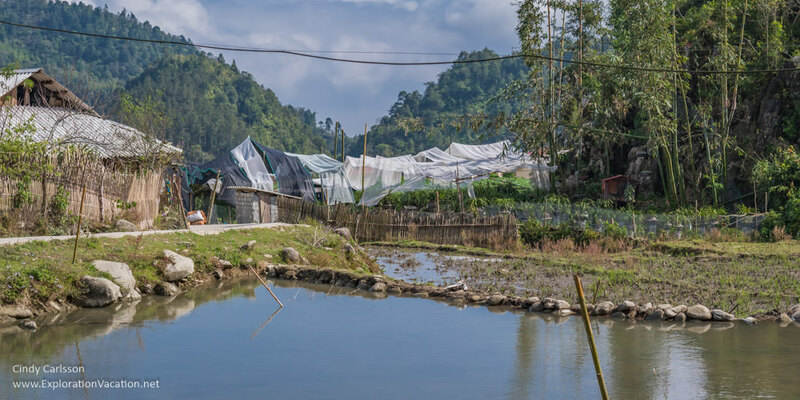 However, unlike many other cities, in Sapa it is possible to actually walk from town into the rural world of the local Hmong and Dao minorities. The area around Sapa is home to the Black Hmong and Red Dao (Yao). Both groups live in villages very near Sapa. However, while the villages look similar to the traditional villages we have seen elsewhere, people here have made adaptations to both accommodate and earn a livelihood from the tourists that increasingly flock to the area. From there, we walk follow the narrow road through more lovely scenery. We also meet a few local residents along the way. The Black Hmong who live here are noted for their fine indigo and batik fabrics. As we walk, we see plenty of signs of their work. Creating and decorating fabric is a never-ending task, and many of the elderly women and young girls we meet are preparing hemp for weaving even as they walk or visit with each other. Once twisted into thread, the hemp will be bleached (using ash) and then woven into long strips of cloth. All along the way we pass fences and clothes lines draped with white (freshly bleached) or indigo (freshly dyed) fabric. Most of the fabric we see will be dyed or printed, but some will serve as the base for elaborate embroidery. And, as we walk through Ma Cha village, we see groups of girls working on their embroidery. Our path takes us past homes and fields and the occasional shop. However, as usual, the terraces attract most of my attention. The Hmong also seem enjoy their view over the terraces. In many places the simple wooden homes of the Hmong line the roadway overlooking their fields. Our guide notes that the Hmong have all their windows on the side facing the terraces and suggests we stop at one of these homes to check out the view from inside. Soon we are in one of the houses, although this one seems to be used mostly as a workshop and staging area for a woman who sells batik fabric. The view from her windows certainly is stunning. However, I am quickly distracted by a long table filled with handmade batik. After much deliberation, I buy a piece that turns out to have been made by another Hmong woman who is also visiting. What a treat to be able to meet the woman who made this beautiful work of art! The fabric I bought was an indigo batik. Further along the road we come to a workshop that teaches visitors how to do traditional batik, along with a variety of other textile techniques. What a wonderful place to learn how these beautiful fabrics are made! My head begins to fill with thoughts of spending a week – or many a month – here learning these traditional techniques. Soon we see the village school in the valley below. Even from above we can hear the sounds of children at play. Our guide loves stopping by schools to visit with the children at recess. He’ll ask them about their studies, but mostly he likes to join them in a playground game or two. His favorite seems to be a Vietnamese version of hacky sack, but today there are lots of kids out and lots of games to try! From the school we continue though the fields along the valley floor. While there are plenty of traditional crops growing here, I am excited to discover that orchids are a popular crop too. If we were here a week later, many of these orchids would be in bloom and on their way to market. It’s something to remember for my next trip. At some point as we cross through the fields that cover the valley floor, we enter the Red Dao (Yao) village of Ta Phin. The Red Dao in this region are noted for a particularly fine type of embroidery. They work intricate designs in minute detail over large sections of fabric to create the effect of a complicated weave. 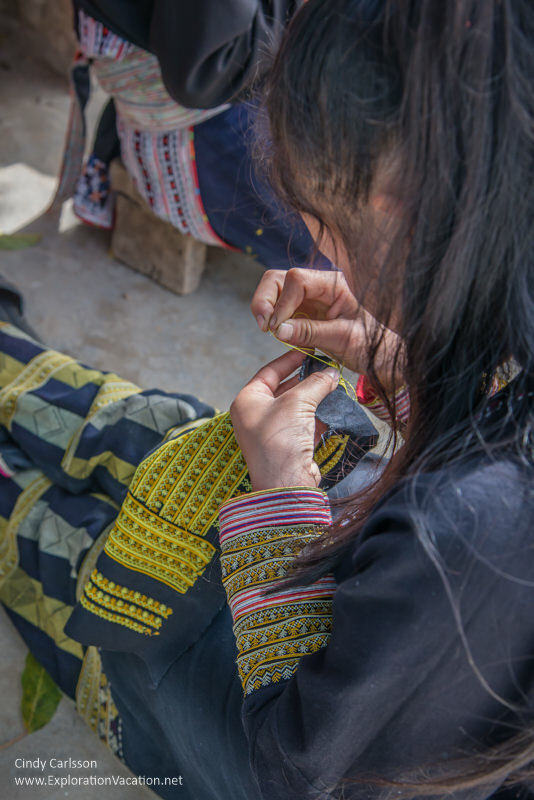 Ta Phin has become a center for the production of this elaborate traditional embroidery, which is both worn by the women of the community and sold in the markets of Sapa and Hanoi. As we walk through town, it seems as if there are women and girls working on embroidery everywhere I look. Back in Sapa, we have a bit of time for shopping – I buy a few small pieces of Hmong-style jewelry (since I have been unable to find any in the markets) and some Vietnamese cinnamon. And then it is time to pack up and head for Lao Cai and the night train to Hanoi. Your pictures are so evocative, Cindy! I’d love to see Vietnam and if it’s as beautiful as in your pictures then it’s worth going. Thank you, Anda. It really is beautiful – and we weren’t even there at the most beautiful time of year! There is a nice mix of city and rural, classic Asia and ethnic minorities, and scenery from beaches to mountains. I was surprised by how good a travel destination it is. I hope you get there some day. I’d contact Hong directly to see what his general availability is and to see how much he can plan for you. (He has a long range plan to partner with an agent to do complete bookings, but I’m not sure if he is set up for that. Vietnam has lots of very specific rules for who can do what.) I’d also ask if there is someone at EXO who he thinks is particularly good and if there are any other travel companies he recommends (so you can compare pricing and options). Note that if he is out on a tour, it may take him a bit to get back to you. If you don’t hear back in a week, try again. Good luck with your trip planning – I think you will love northern Vietnam.